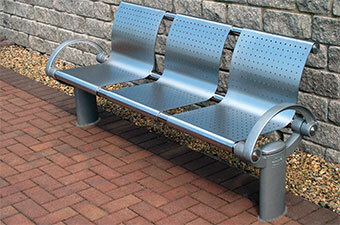 Stainless steel seat with laser cut perforations and cast ductile iron supports and arm rests. Supports and arm rests are manufactured from 10mm cast ductile iron, which is more durable than cast iron. The ductile iron components are galvanised with powder coat finish, as we manufacture all our products in house we can arrange any colour combination you require. 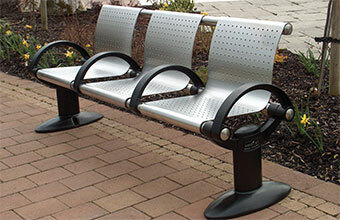 Seat is manufactured from 4mm stainless steel. Seat and frame are 316 grade stainless steel in an electro- polished finish (corrosion and salt water resistant). Fixtures and fittings are stainless steel. Supports can be root fixed or surface mounted. Extremely vandal resistant and maintenance free. Surface Mounted – There are 2 fixing points on each support. Root Fixed – The root fixing is a base plate 130mm underground level with 4 fixing points on each support. Recommended concrete foundation 2000 x 800 x 150mm. Extra dividing arms can be added (ref. HC2032S – 3 Seater).